Item # 145052 Stash Points: 3,995 (?) This is the number of points you get in The Zumiez Stash for purchasing this item. Stash points are redeemable for exclusive rewards only available to Zumiez Stash members. To redeem your points check out the rewards catalog on thestash.zumiez.com. The Gold Layered CZ earrings from King Ice offer a unique layered deign that will add some luxe styling to any kit. 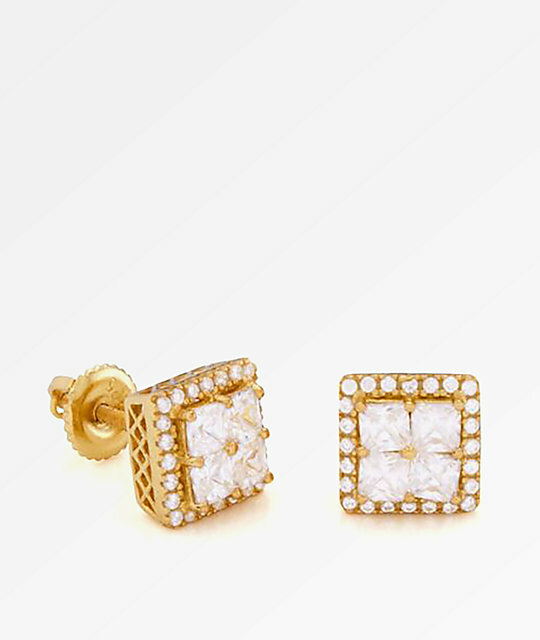 These earrings are made with a 14K gold plated .925 sterling silver construction that contains 4 squared white CZ stones surrounded by smaller rounded stones hand-set on a micro pave setting. These earrings use a screw back setting that offers a secure fit. Gold Layered CZ earrings by King Ice.